ABS just means A Basic System, which is the name I've used for the 1d12 version of the game I called ABS12. 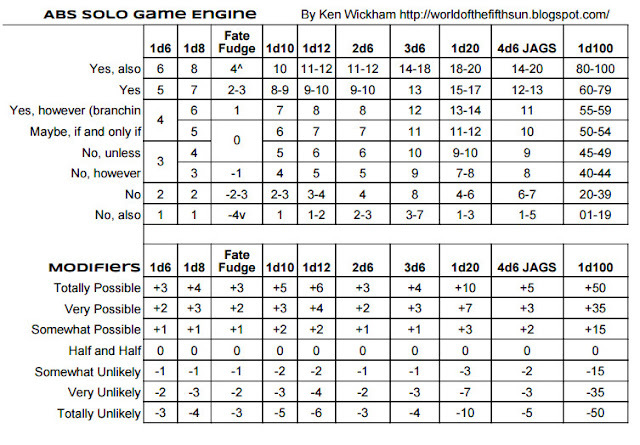 This is the flexible version based off of my original ABS12 solo game engine version. This is usable for most gaming systems. This is meant to help emulate a gamemaster when playing alone using the system. A question is asked about the scene, situation, or facts about the current game. It's as if asking the storyteller about what is happening. The appropriate die for the system is then rolled. The chart is consulted and then interpreted. Ex. Does the character see anything around? Roll. Yes, your character sees something. Very early in developing A Basic System 12 (ABS12) I want to include a solo gaming engine. That way the system can develop with such system already included. This is now included with the blog page which has the system. I began with a version influenced by roryb bracebuckle's epic d6 found at http://noonetoplay.blogspot.co.uk/2013/11/epic-playtest-bird-of-wisdom-part-2.html. I also considered differing from Zach Best's CRGE by focusing on the kinds of decisions a player makes rather than the results of situations that have 'unexpectedly' results. I wanted to try adding another layer of action into the engine. One particular area that I thought of is making the middle area more influential. And to somehow adding a Maybe-type section. One possibility is making the 'Yes, but' and 'No, but' into two distinct types of 'but's. One that is branching out - creating new options, and one that depends upon a condition. Conditionals are like a gamemaster saying, maybe yes, if and only if this other thing is done, occurs, or is satisfied. Or its like saying, no, unless you happen to be able to do this thing. For branching it's like saying, yes you perform the task well, in addition you notice this other situation that may not be good. Or no, you failed, however you notice this other situation that may be good. If trying to answer a description question, these answers might hinge on other possible descriptions. Q. "Is that blue?" A. "Maybe it's blue, if your seeing it correctly. The light might be throwing off the color a bit. Try looking at it from another angle." Q. "Is she my mother. A. "She might be, your not quite sure. She doesn't talk about your early childhood. You'll have to ask her further about your childhood." The main considered change is #6 and #7. The howevers would indicate the presence of a new concerning factor that may present further opportunities. What the player does with those presented factors, is up to the them entirely. It can be a new fact, something noticed, or just 'something isn't right'. The howevers may not necessarily cause another action check - they create additional descriptions and facts that could be considered either neutral or slightly opposite in polarity. They can create branches - additional options. The character can continue to go the way, see, or realize something they intended, or they can consider this newly discovered factor. They can represent forks in a road. It is presenting facts for at least two or more options. The if and only if and 'unless' are meant to differ in that they are conditional elements. The answer is directly tied to some sort of conditional action or requirement. Some other issue must be satisfied. These are meant to cause another test or roll. These are sharp turns in a road. These are made to prolong the tension and result of the prior roll. It's basically a roll again, which must be explained in the story just why another roll must be made. One good way to find a testable statement is to use "Perhaps ..., " and then fill in a statement or situation action. "Perhaps your not seeing things correctly." And then test it. "Perhaps you need to check to see if you somersault wisely to avoid that rolling boulder." And then roll. "Perhaps your a little distracted to fight properly." And roll a focus roll. It works similar to "Unless ... ."
"Unless you're seeing things correctly." And then test it. "Unless you somersault wisely to avoid that rolling boulder." And then test it. "Unless you're focused to fight properly." And then test it. The and statements mean that the answer is doubled, either double good with an additional good result - a bonus. Or it's double negative. Not only 'no', it's also more negative because ... .